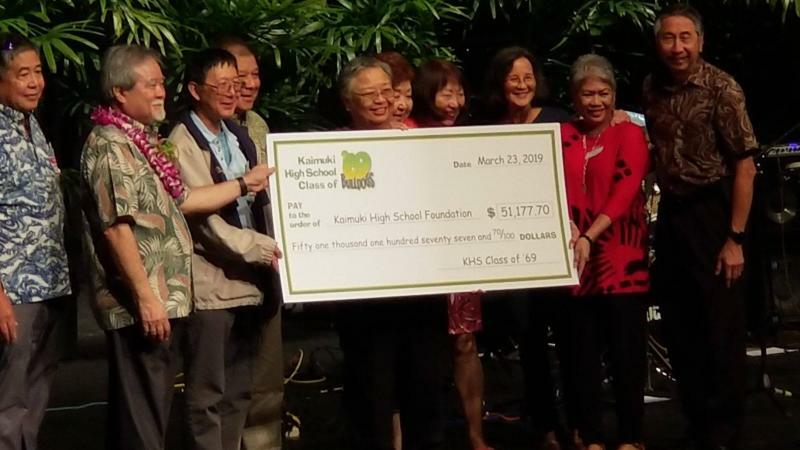 Steve Nakashima (with lei), KHS Foundation President, accepts a $51,177.70 check from members of the Class of 1969. All of us at the Kaimuki High School Foundation would like to extend our grateful thanks to the Class of ’69 for all that you have done and continue to do in your “50 for 50” campaign. Your class has been a big inspiration and leader in supporting the Foundation’s efforts to assist the KHS teacher and student community. Support of the Performing Arts - funding for the royalties for the play "Mama Mia” which will be performed in Spring 2019. Funding for Special Education and impaired students for class supplies, safety mats and sensory toys. Support of the Freshman Career Fair. Funding for the STEM (Science, Technology, Engineering and Math) Academy for chemistry equipment and the Statewide Science Competition. Support of the JROTC by providing funding for the training camps and competitions. Funding to enable students to attend college and career field trips. Support of the Kaimuki High School football team for their September football game in Nevada. Funding to enable student body leaders to attend student leadership trainings. As you can see, a wide cross-section of the student body is being provided invaluable assistance through your donations and the Foundation will continue to strive to ensure that your donations make a difference in the lives of the students at Kaimuki High School. All the best to you and your Class of ’69 as you approach your 50th reunion.